Samphire (also known as marsh samphire, salicornia, or sea asparagus) is a salt tolerant plant that grows near the sea. In Italy it is called asparagi di mare (sea asparagus), although I don’t think it tastes like asparagus. Samphire is crunchy and has a fresh and salty taste. 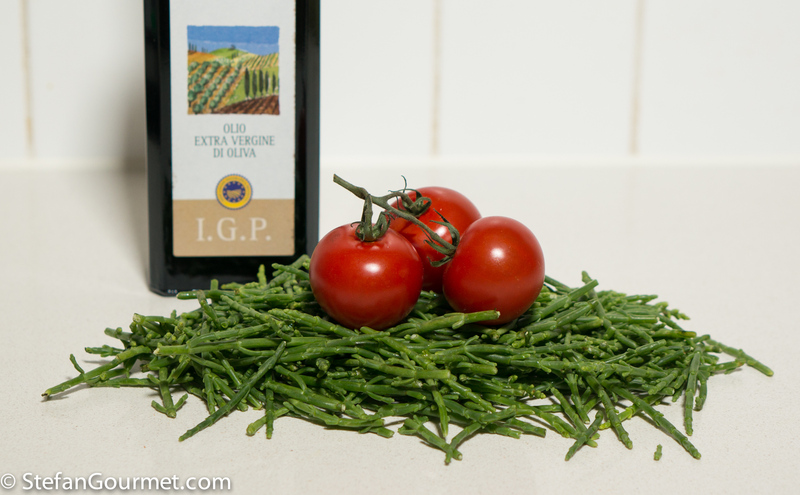 At La Perla in Calasetta in Sardinia the antipasti also included a very simple but delicious salad of blanched samphire with tomato and olive oil. So far I had only prepared samphire sautéed. I noticed that blanching it removes some of the salt, which is nice. 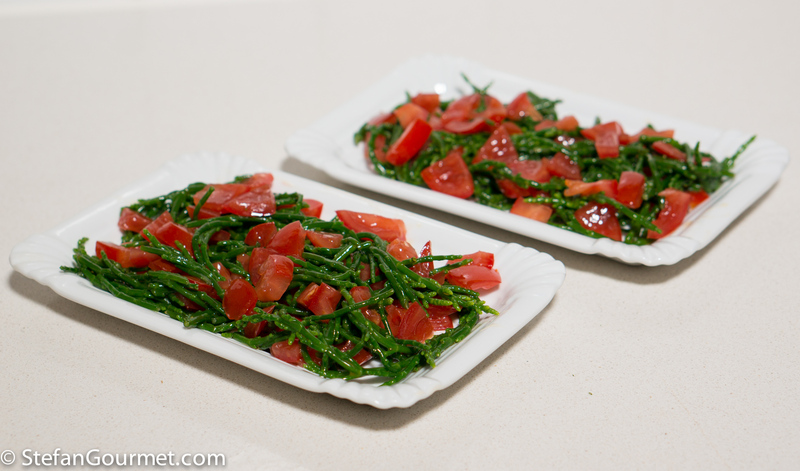 Mixed with good tomatoes, this is a very simple yet still special treat as samphire is not usually on the menu. It is easily available in the Netherlands at fish mongers under the name of zeekraal. Bring a pot with about 1 litre (4 cups) of water to a boil. Do not add salt to the water, as part of the reason for blanching the samphire is to reduce the amount of salt. 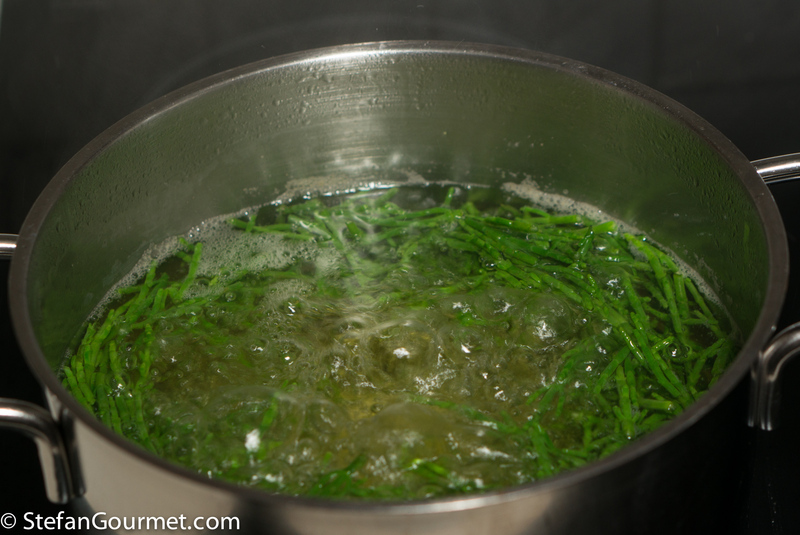 When the water boils, add the samphire and blanch until tender but still slightly crunchy, about 2 minutes. Shock the samphire in (ice) cold water to stop the cooking. 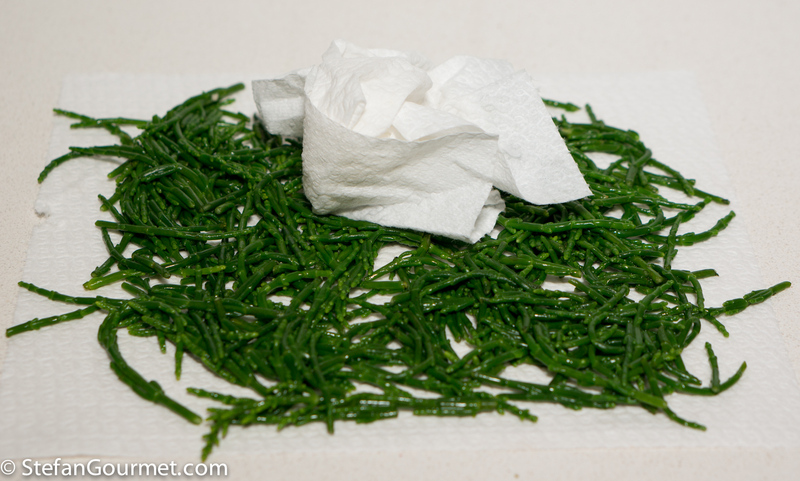 Drain the samphire well and pat it dry with paper towels. 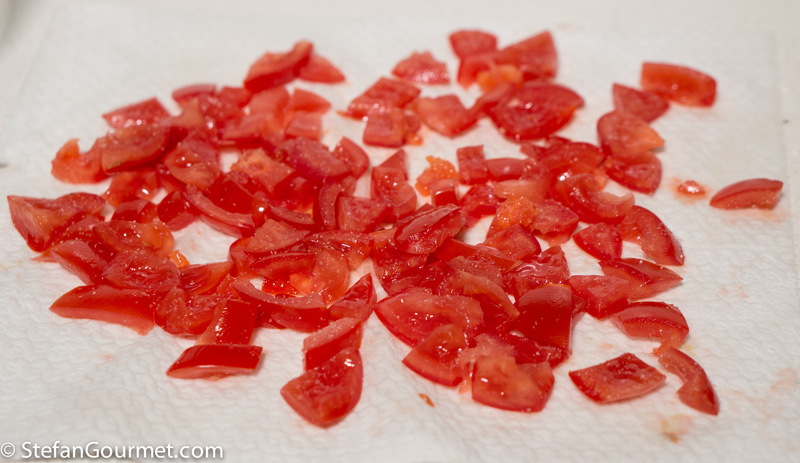 Cut the tomatoes in half crosswise and remove the seeds with your fingers (or a small spoon). 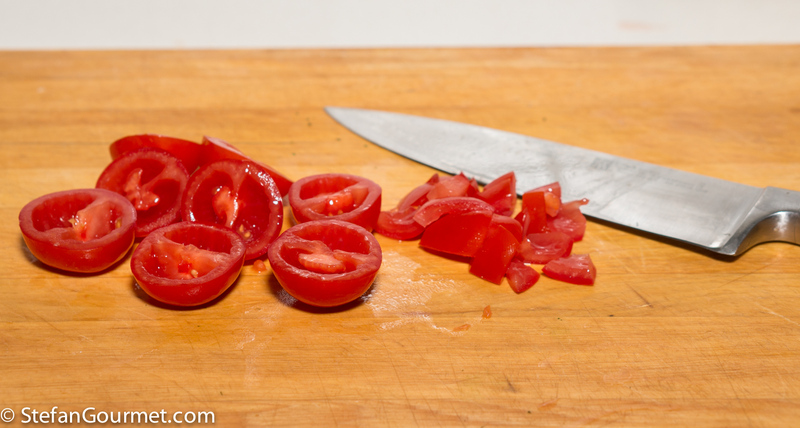 Then cut into small pieces. Season the tomatoes lightly with salt (optional). This helps to balance out the flavor between the samphire and the tomatoes. 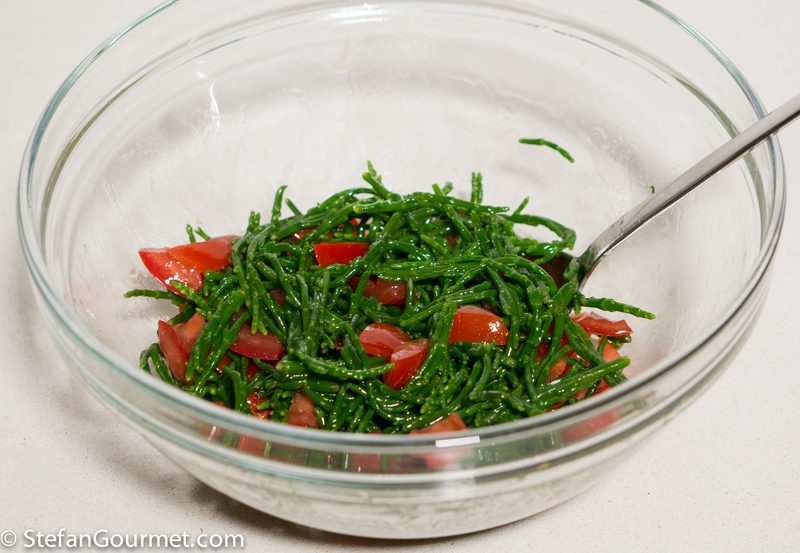 You may want to taste the samphire and tomatoes together before doing this, as the samphire is already quite salty. 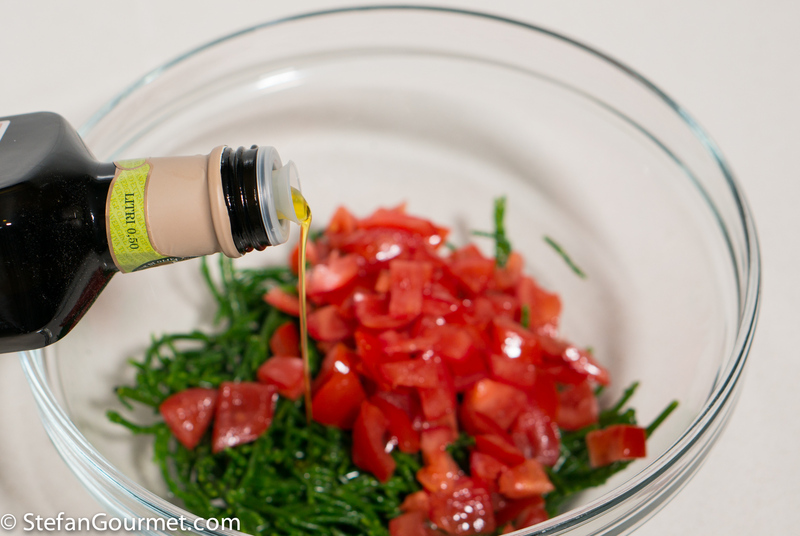 Combine the samphire and tomatoes in a bowl, and add good quality extra virgin olive oil. Stir until everything is coated with the oil. A special technique for cooking pasta is to cook it “risottata”, which is pasta cooked in the way of risotto. This means that the pasta is cooked in stock from the start, and more stock is added as needed during the cooking process. 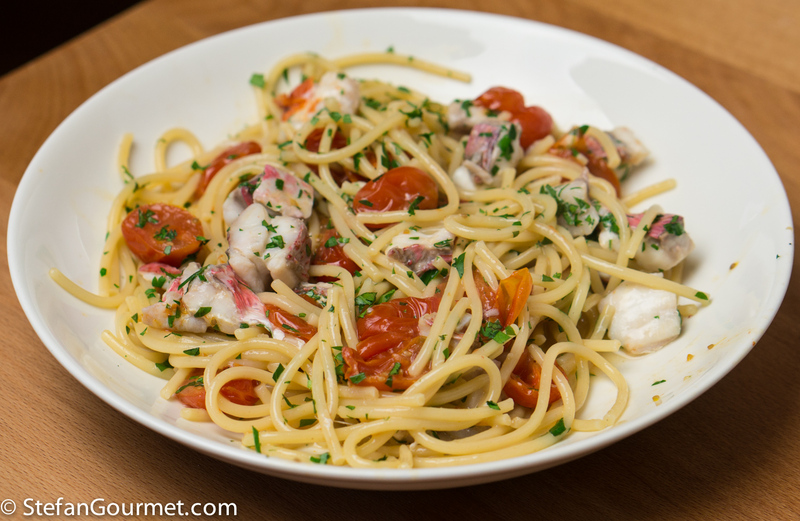 This is a great way to prepare spaghetti with red mullet. What a beautiful, vibrant dish Stefan! I have never heard of sea asparagus, interesting. I see you’ve also changed your WP theme, very nice! It has many names and varieties. There ought to be something similar on the West Coast, too. It was time for a new theme and I like this one very much. Hi Stefan! This is the very first time ever I’ve heard about asparagi di mare. I love this recipe and I truly hope someday to have the chance to try it! Thanks for sharing! Well, Down Under it IS called samphire . . . only now becoming a fairly common ingredient of salads and stirfries. Only gathered on the cooler southern beaches and not all that salty by the time we can buy. But I love the name ‘sea asparagus’! I wash it and use it as it is . . . . 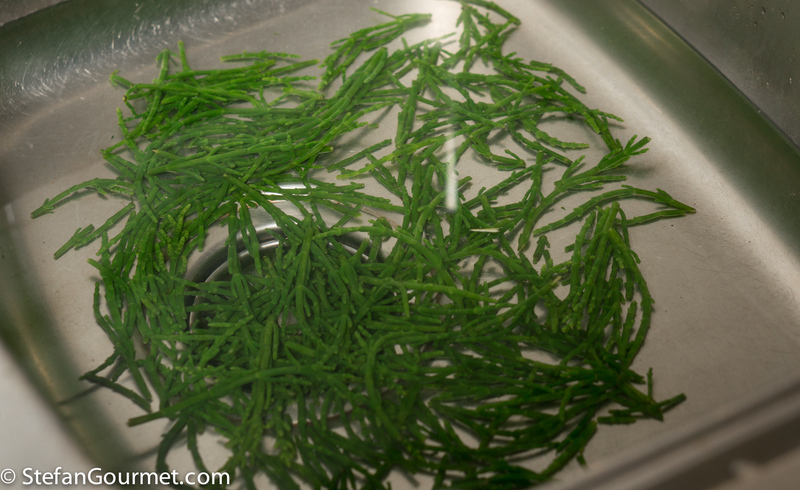 I never tried samphire, sounds lovely in a salad, or in a sauce, would love to give it a go! That salad looks lovely. I can’t wait to make this with asparagus when my tomato garden is ready to harvest. I feel like it’d be fun to add some kelp. 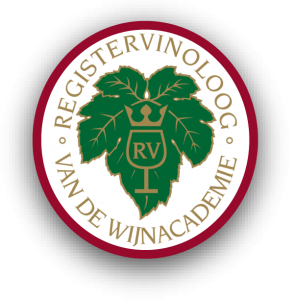 Although I’ll try to remember it when I visit The Netherlands to try the real thing. Never tried it blanched marsh samphrie, I also sautéed it. Next time I see it at the fish monger I’ll be giving this a try.